Anastomosing hemangiomas are rare benign vascular lesions with predilections for the genitourinary tract. We present a case of bilateral renal tumors detected during pretransplant evaluation and underwent laparoscopic bilateral radical nephrectomy. Histological diagnosis was anastomosing hemangioma confirmed with immunohistochemistry. As the final diagnosis was of benign nature, the patient was maintained on the transplant waitlist. As both renal cell carcinoma and renal anastomosing hemangioma have predilection for end-stage renal disease with no radiological differentiating features, the accurate histopathological examination with immunohistochemistry is essential for the diagnosis. Vascular tumors of the kidney are uncommon and include arteriovenous malformation, capillary hemangioma, and angiosarcoma. Montgomery and Epstein in 2009 described a rare, unique neoplasm of benign nature called as anastomosing hemangioma. It has been described as variant of capillary hemangioma. Here, we present a case of bilateral anastomosing hemangioma in a patient with end-stage renal disease (ESRD). Thirty-six-year-old male who is a known patient of ESRD from 2005 presented to us with a history of undergoing a live-related renal transplantation through a right paramedian incision in 2008. His preoperative evaluation showed the presence of right-sided mid-polar renal cortical cyst measuring about 8 mm in 2007. Postrenal transplant, he had a stable graft function for 24 months. Later, he developed features of graft loss and is on thrice weekly maintenance hemodialysis from 2013 till now. He underwent a plain computed tomography abdomen in 2016 for persistent fever, which revealed a slight increase of the renal cortical cyst to 13 mm. At presentation, he was on fluid restriction and had oliguria. He had a hemoglobin level of 9.7 mg/dl, and his renal function showed a peak creatinine of 11.1 mg/dl. In view of oliguria, a routine urine microscopy could not be performed. Pretransplant evaluation by ultrasound showed the presence of bilateral multiple hypoechoic lesions without hypervascularity. He subsequently underwent a contrast-enhanced computed tomography abdomen, which showed the presence of two lesions in the right kidney, one measuring 2.6 cm × 2.5 cm in the upper pole and another 1.0 cm × 1.5 cm lesion in the lower pole. Left kidney had a lesion of 1.7 cm × 1.8 cm at the interpole region. All lesions showed the presence of heterogeneous enhancement in the arterial and venous phase, with complete washout in the delayed phase. Another nonenhancing exophytic cyst measuring 1.4 cm × 1.5 cm was observed in the right lower pole [Figure 1]. As the FDG Positron-emission tomography has low sensitivity for primary renal neoplasia due to its presence in the renal cortical tissue and renal excretion, positron-emission tomography was not considered for our patient. A diagnosis of bilateral renal cell carcinoma was made and surgery was planned for him. After discussing the treatment options, he underwent simultaneous bilateral laparoscopic radical nephrectomy. The dissection was completed laparoscopically on both sides, and the specimen was left in the pelvic cavity with the ureter in situ. The patient was then made supine and through an upper midline incision, both kidneys were extracted out after clamping the ureters. Since the patient is on the waiting list for a second renal transplant, which is proposed on the left side, a Pfannenstiel or left-sided incision was avoided. Postoperatively, the patient recovered well without any complications and discharged on the 3rd-postoperative day. He is on maintenance hemodialysis and is continued on the pretransplant waiting list for a deceased donor. Histopathologically, in the right kidney, there were two cysts measuring 1.2 and 2.0 cm and a tan–brown nodule measuring 1.7 cm and another of size 1.3 cm in the left kidney. Microscopically, sections showed renal parenchyma with numerous cysts lined by flattened epithelium, few of them filled with red blood cells. There was a fairly circumscribed tumor composed of multiple ectatic thin-walled vascular channels lined by endothelial cells. In foci, the vessels display sinusoidal architecture with hobnail appearance of endothelial cells. There was no evidence of mitosis or atypia. 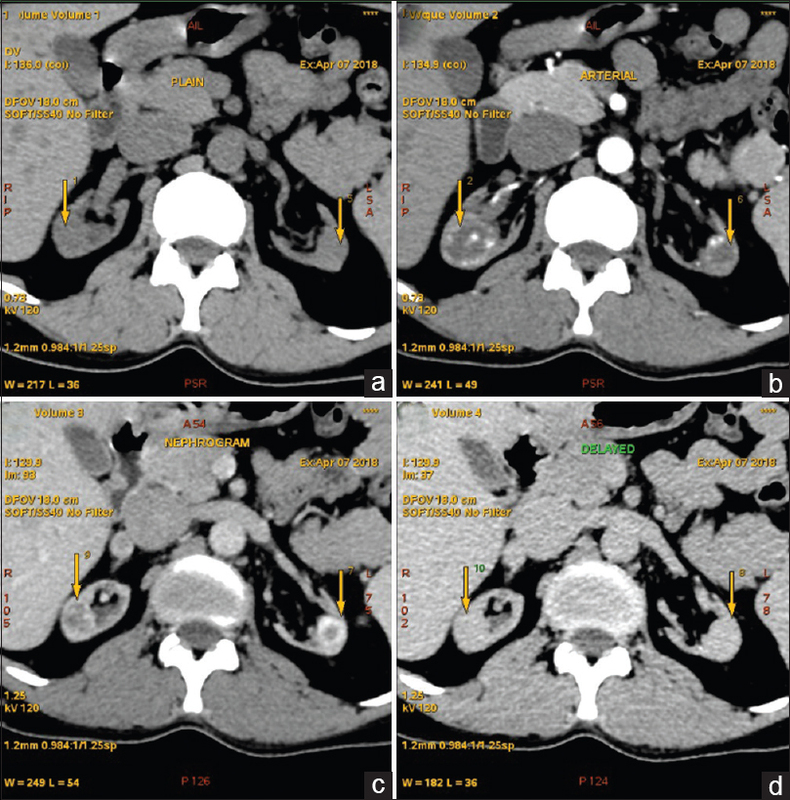 Even though preoperative diagnosis based on the radiological imaging was a suspicion of renal cell carcinoma, histopathologically, the renal parenchyma was normal. To confirm the vascular nature of the lesion, immunohistochemistry with CD34 was done which was positive. Negativity for pancytokeratin (AE1, AE3) excludes the possibility of cystic renal cell carcinoma with intense vascularity. The final impression was bilateral anastomosing hemangioma [Figure 2]. There is a slight male preponderance. Average presentation is in the sixth decade, but patients in ESRD group are usually younger. Most lesions are unilateral, occasionally, bilateral in ESRD patients. Our patient has synchronous bilateral lesions. Patients may present with hematuria or it may be an incidental detection during workup for other symptoms. There are no specific radiological findings or signs; hence, the diagnosis can be misleading. It is commonly misdiagnosed as renal cell carcinoma and treated accordingly by radical nephrectomy or partial nephrectomy. In our case, the mass lesions in both the kidneys showed arterial and venous enhancement postcontrast with washout in the delayed phase. This prompted the suspicion of renal cell carcinoma. Even if preoperative radiological diagnosis is made, the possibility of tissue diagnosis by computed tomography-guided biopsy is debatable, as the tumor is a vascular lesion and the chances of biopsy-induced hematoma necessitating immediate interventions are high. In addition, anastomosing hemangiomas in ESRD are associated with renal epithelial neoplasm in 43.7%. Anastomosing hemangiomas have to be differentiated from angiosarcoma, angiomyolipoma, and cystic renal cell carcinoma. The presence of atypia, mitosis with multilayering of the endothelium, favors angiosarcoma though positive for similar immunohistochemical markers such as CD31, CD34, and Factor VIII-related antigen. Medium-sized vessels with adipose tissues and smooth muscle actin indicate angiomyolipoma. Cystic renal cell carcinoma with extensive vasculature may be differentiated from anastomosing hemangioma using immunohistochemical markers such as pancytokeratin or epithelial membrane antigen, which are positive for renal cell carcinoma. The presence of malignancy necessitates minimum 2 years waiting period for renal transplant. Patients with anastomosing hemangiomas can continue to be in the waiting list for transplant, as it is benign in nature. As both renal cell carcinoma and renal anastomosing hemangioma have predilection for ESRD with no radiological differentiating features, accurate histopathological examination with immunohistochemistry is essential for the diagnosis. The authors would like to thank the Department of Pathology, SIMS Hospital, Vadapalani, Chennai, Tamil Nadu, India. Montgomery E, Epstein JI. Anastomosing hemangioma of the genitourinary tract: A lesion mimicking angiosarcoma. Am J Surg Pathol 2009;33:1364-9. Martignoni G, Cheville J, Fletcher CD, Pea M. WHO Classification of Tumours of the Urinary System and Male Genital Organs. 4th ed. Lyon: International Agency for Research on Cancer; 2016. p. 66-7. Brown JG, Folpe AL, Rao P, Lazar AJ, Paner GP, Gupta R, et al. Primary vascular tumors and tumor-like lesions of the kidney: A clinicopathologic analysis of 25 cases. Am J Surg Pathol 2010;34:942-9. Berker NK, Bayram A, Tas S, Bakir B, Caliskan Y, Ozcan F, et al. Comparison of renal anastomosing hemangiomas in end-stage and non-end-stage kidneys: A meta-analysis with a report of 2 cases. Int J Surg Pathol 2017;25:488-96. Tao LL, Dai Y, Yin W, Chen J. 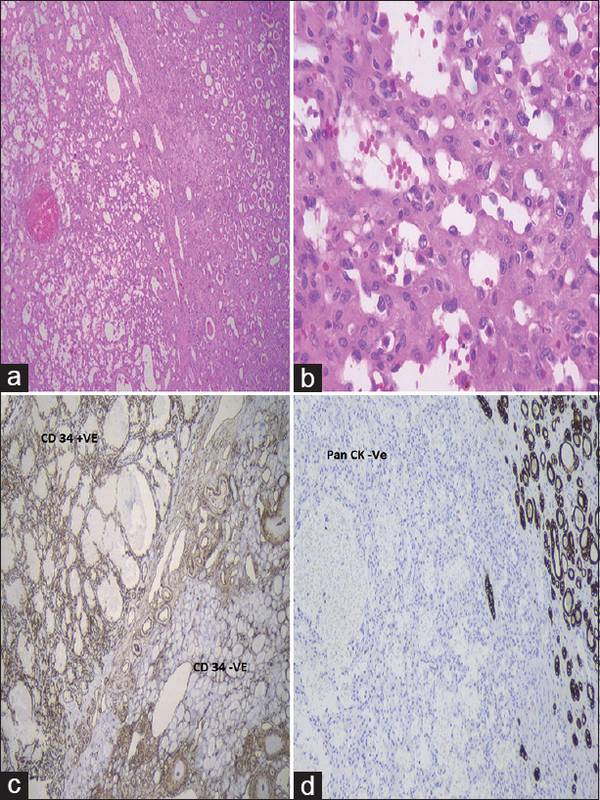 A case report of a renal anastomosing hemangioma and a literature review: An unusual variant histologically mimicking angiosarcoma. Diagn Pathol 2014;9:159. Kryvenko ON, Roquero L, Gupta NS, Lee MW, Epstein JI. Low-grade clear cell renal cell carcinoma mimicking hemangioma of the kidney: A series of 4 cases. Arch Pathol Lab Med 2013;137:251-4.